How Do Suited Connectors Perform? Everyone loves suited connectors. They are fun hands that hit a variety of things postflop and offer lots of options. But many people don’t fully understand how suited connectors perform. My goal is to teach you once and for all how these hands hit flops, the differences between high and low ones, and how to use this information to your advantage. If you’d rather read than watch the video, you can enjoy the script below! Hello, and welcome to today’s Quick Plays video on the science of suited connectors. Most players get very excited when they look down at a hand like T9s or 76s, but do you know how these hands really perform? In this video, I’ll show you how these hands hit flops and how to better visualize them in the future! Before we get started, the tool we are going to use is called Flopzilla. This is a paid-piece of software that you can pick up from Flopzilla.com, and I’ve done an extensive video using this software as well. You don’t need this software to succeed in poker, but if you are studious, this software will pay for itself very quickly. That being said, in Flopzilla we can plug in a single hand on the left and we will get a full breakdown of how the hand hits the flop on the right. So let’s get to work! To start, let’s just plug in 76s on the left. Let’s spend a minute and see how it hits the flop using the output on the right. We notice that it smashes the flop with two pair or better roughly 5.5% of the time. Many players make the mistake of thinking a hand like this smashes the flop a lot more often…but the reality is quite different. A hand like 76s also flops some pairs, although not many top pairs at only 4%. Notice that when 76s flops a pair it’s usually a second or third pair, and it does that almost 25% of the time. This makes sense though, it’s not a very high suited connector and thus when it pairs it’s usually going to be a weaker one. This actually presents a major issue for players who haven’t solidified their postflop strategy yet. Single pairs are already tough to play, and it only becomes tougher when that pair is weak and small. Since future cards will usually be over cards and there are two cards left to come! If you aren’t sure how to play weak pairs with or without the lead in a hand…suited connectors can present some real postflop problems. THEN we get into the drawing element of suited connectors. Notice that 76s flops a flush draw 11% of the time and an open-ended straight draw 10% of the time. So roughly 21% of the time 76s will flop some sort of decent draw. Now draws are great, but these draws will only complete a small percentage of the time by the river. If we take an average of 8.5 outs, they will only improve to a straight/flush by the river about 34% of the time. And if you will only get a one card draw, for the times Villain applies too much pressure to you, then it gets worse. Now not all suited connectors are the same. Let’s quickly look at the difference between a big suited connectors, like JTs and a small one like 54s. With 54s notice that it still smashes the flop 5.5% of the time and it still flops a draw 21% of the time. Now keep an eye on the pair stuff. Notice it flops top pair 1% of the time and flops second-third pair 28% of the time. If we switch over to JTs we see it smashes the flop the same %, it flops a draw the same %, but the pair range is much different. JTs flops top pair 15% of the time and only flops second or third pair 14% of the time. This makes sense though. The bigger the cards, the more top pairs it will catch. The lower the cards, the more weak pairs it will catch. Nothing too surprising here. But think for a moment about the draws. When a small suited connector flops a draw it isn’t as likely to have overcards to the board that it can use to improve to a winning pair on future streets. On the contrary, a hand like JTs can easily flop a draw with overcards that can turn or river winnable pairs. So the bigger suited connectors gain an equity boost going into the turn and river. And even think about how the hands perform when they miss, flopping no draw or pair. Bigger suited connectors again have a higher chance of flopping overcards that can then pick up equity on the turn, a winnable pair, etc. Smaller suited connectors don’t have nearly the same level of luxury. And you can use the same logic with gutshots…I’d much rather have a gutshot with two overs than a gutshot with two under cards! So far I haven’t mentioned whether we had the lead and opened a suited connector, three bet one, or just called an open-raise with one. Regardless of the action you take preflop your hand will still hit flops at almost the exact same percentage. But one thing to consider is that if you open a suited connector and villain calls…your equity will differ versus you calling a suited connector against villain’s open-raise. We can proof this easily with software like Equilab. Say we have 98s and we open-raise. If villain calls his range is going to look different than if he had opened himself…since calling ranges don’t normally include the strongest of hands like AA, KK, and AK. So if villain calls a range of 22-JJ, AQ, AJ, KQ and suited connectors, our 98s has 43% equity. Now this is hot/cold equity, meaning it assumes we’ll always get to showdown…it’s not perfect by any stretch, but it’s a starting point. If we change the situation and face a raise from villain while holding 98s, and give him a range of 22+/AJ+/KQ, then our equity drops down to 38%. Now this opening range can easily offer more implied odds since it has those strong overpairs included…but it’s worth noting how the hand’s equity changes against different types of ranges. The goal of this video is NOT to tell you how to play every suited connector, preflop nor postflop. The goal is to arm you with the knowledge of how these beloved hands perform on the flop and how to visualize the profitability of them. 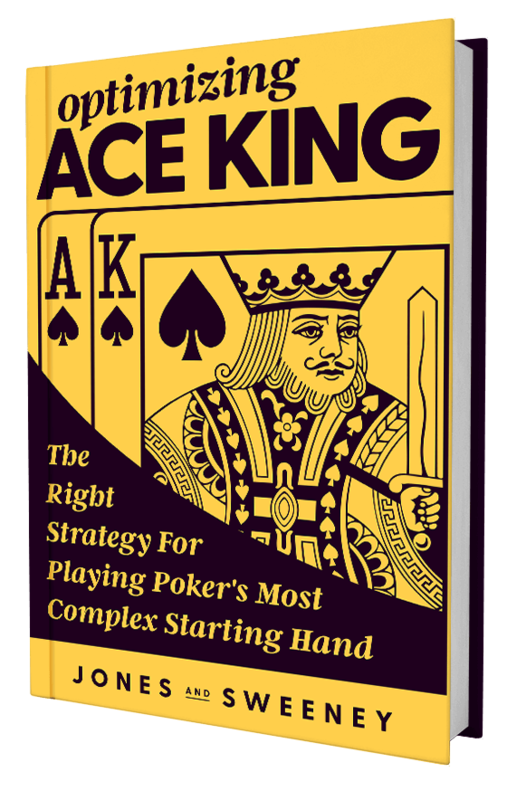 They still miss the flop about 2/3 of the time on average…but knowing that they smash the flop only about 5.5% of the time, and that they hit decent draws about 21% of the time is helpful information. As always, knowledge is power. Understand not only how the hand actually hits, but how you can use these hands to your advantage. Are you confident that you can play the draws well? Are you confident that you can play the tough pairs well postflop? Are you confident that you can float the hands well when they flop nothing more than a backdoor draw? If not, you may want to reconsider how often you get involved with these hands preflop!